The largest unit of ecological classification that is convenient to recognize below the entire globe. 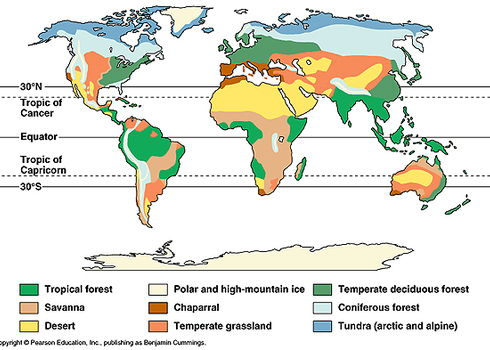 Terrestrial biomes are typically based on dominant vegetation structure (e.g., forest, grassland). Ecosystems within a biome function in a broadly similar way, although they may have very different species composition. For example, all forests share certain properties regarding nutrient cycling, disturbance, and biomass that are different from the properties of grasslands. Marine biomes are typically based on biogeochemical properties. Biomes of the world. Pearson education, Inc.